Sermon preached on Matthew 6:14-15 by Rev. 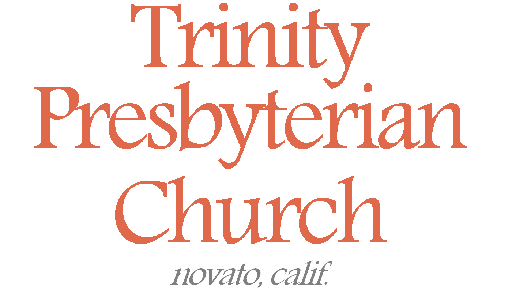 W. Reid Hankins during the Morning Worship Service at Trinity Presbyterian Church (OPC) on 7/20/2014 in Novato, CA. There are two great truths here. One, that humans will be in need of each other’s forgiveness. Two, that humans will be in need of God’s forgiveness. The reason for these truths is simple. It’s summed up with the word we see here three times: trespasses. Humans trespass against each other and against God. This is a fancy word for an offense against someone. Most specifically, it’s about a violation of God’s laws. It’s a false step, it’s about falling down over some point of the law, being tripped by the demands of the law, when you break it. God’s law governs how we are to treat other humans and how we are to treat God. When we sin against each other, we are transgressing the law of God. That means we are in need of being forgiven by both the human we offend and ultimately by God who is the lawgiver. And so in life, we see these two truths quite clearly. Humans will be in need each other’s forgiveness, and humans will be in need of God’s forgiveness. These truths are here in our passage for today. And yet this passage does not mention these truths in isolation from each other. No, this passage makes a connection between these two truths. It connects our forgiving of others with God’s forgiving of us. As a Christian who has been forgiven of our sins by the sacrifice of Jesus, we know this is an appropriate attitude for us to have. We should see that how God forgives us should be connected with how we forgive others. And yet as we come to a passage like this, we likely sense a difficulty. That’s because the connection that’s made here is a condition. It says that God only forgives us as we forgive others. The difficulty we have with this is that we surely recognize how imperfectly we have forgiven others. We would not want God to forgive us in a similarly imperfect way. What then do we do with this passage? Let’s begin then first today by recognizing the difficulty we have as Christians with the principle given in our passage for today. Since this conditions God’s forgiveness of us with our forgiveness of others, we have to ask how this connects with the gospel. We know from the gospel that fundamentally our forgiveness rests on the sacrifice of Jesus Christ. So then, is this saying that in order to be forgiven of our sins, that the instrument to receive the forgiveness won by Christ, we have to forgive others? Is that then how we are saved by Christ? Is that the gospel — that Christ died for you, so if you but now forgive others then you can be forgiven too? Well, for us as Christians, we know that is not what the Bible teaches. The gospel declared in the Bible very clearly affirms that we need God’s forgiveness. The gospel is very clear that this is why Jesus died on the cross. On the cross, Jesus paid for our sins. He satisfied the debt of our sin, so that we could be divinely pardoned. But how then do we receive this forgiveness of sins achieved by Christ’s death on the cross? The Bible is also abundantly clear — it’s by faith. Faith is the instrument for receiving this forgiveness. Romans 3:25, for example, says that Jesus’ work on the cross was a propitiation for our sins, and that we receive that by faith. Faith is instrument of receiving the forgiveness won for us by Christ. Faith is that instrument, and not how we forgive others. So then, what do we do with this passage? There is clearly the conditional language here that conditions God’s forgiving of us on our forgiving of others. It’s actually repeated twice in two different ways. The point is emphasized. How do we reconcile this teaching of Jesus with the gospel that says we are justified by grace through faith in Christ? Well the simple solution is to state that this passage gives us a law of God. To be clear, it’s a law that we break. It’s a law we transgress. It immediately leaves us needing the divine forgiveness that we have been disqualified from by this very law, because we break the law. As such, this is a law that leads us to the need for Christ and the gospel. Then, having come to know that gracious forgiveness, we are again called to try to keep this law. Let me give a clarification here when we call this a law. It’s a little complex because the law here is not simply that if you forgive others then you merit God to forgive you. No, that’s not biblical. We will see today that our forgiveness of others doesn’t earn or merit God’s forgiveness of us. That’s in part because the difference in debt is too great. Any way a human becomes indebted to us from their sin against us, is infinitely smaller than how we have become indebted to God because of our sin against him. And so the law here isn’t that if you forgive humans like this, then you will earn divine forgiveness. No, if you could earn such forgiveness, then there would be no reason for Jesus to have had to die on the cross. Rather, the law idea here is that if you want to be forgiven by God of such a greater debt that you owe him, it is only righteous that you strive to show an analogy of that same mercy toward others. To not be forgiving when God forgives you of so much more, would be unrighteous. Or to say it in reverse, it’s the righteous thing to forgive others of lesser debts if we want God to forgive us of greater debts. So then, this is how to approach this passage. When thinking in categories of law and gospel, this falls primarily into the category of law. How then do we make use of this law principle here? Well, as Christians, there is then a pedagogical use of this and a normative use. I’ll define those terms now. A pedagogical use is one that looks at the law of God, sees how we transgress it, and it leaves us seeing our need for grace and forgiveness. This pedagogical use then drives us to Christ as the only hope for law transgressors. And so that use of the law drives us to Christ to become a Christian and thus to find forgiveness and grace. That’s the pedagogical use. The normative use, on the other hand, says that after having become Christian, the law still serves to guide our living as a Christian. The law still is normative for the Christian, meaning that it still tells us the standard for how we live our life. And so, as we approach our passage today, and recognize it as law, we see a pedagogical use and a normative use for us. So then, I want to spend the rest of our sermon thinking about those two uses as it pertains to this passage. I want us to think about this with regard to this connection of how we forgive others with how God forgives us. There is a pedagogical use and a normative use of this passage. Let’s begin with the pedagogical use. To start, I point out the bare language that we’ve been studying here. In two different ways it makes the connection that we shouldn’t expect divine forgiveness if we haven’t forgiven others. To do so would essentially reflect the double standard idea that’s so often condemned in Scripture. That’s when you hold up one standard for yourself and another standard for others. Applied to this passage, it’s saying that it’s wrong of us to so strictly call others to account, and withhold forgiveness, all the while expecting God to so freely and graciously forgive you. That’s you saying that others are held to a different standard than how you want God to hold you. The point of that parable is clear. It was literally “wicked” of the servant to not forgive his fellow servant of such a small debt in light of how much he had been forgiven by the king. There’s a moral principle here that the unforgiving servant had failed in. This is the “law” idea that I’m talking about today; why I’m saying that this fits in the category of “law”. And so, I hope the point of the parable helps us to recognize the same point in our passage for today. This is a logical and consistent demand. Think about the hypocrisy and selfish pride, and overall evil in our heart that is revealed when we are unwilling to forgive others, while simultaneously expecting God to forgive us. And so this is a moral law: it’s only right that if we want God to forgive us, we should be forgiving of others too. And yet as much as we can affirm that moral principle, I am sure that none us of have been as forgiving as much we ought. I’m also sure that none of us have forgiven others in the way that we want God to forgive us either. I think of Psalm 103:2 talking about how God forgives our transgressions. He says that “as far as the east is from the west, so far has He removed our transgressions from us.” Or in Isaiah 43:25, God says, “I, I am he who blots out your transgressions for my own sake, and I will not remember your sins.” This is exactly the kind of real forgiveness we want from God. But if we are honest with ourselves, it is so often the kind of forgiveness we really struggle to give to others. Yes, hopefully, as Christians, we have begun to truly grow now in our forgiving of others. But we know too well how hard that can be. Especially when we think of how it was put at the end of that parable from Matthew 18 — that we should forgive from the heart. From the heart! That’s the real difficulty. Maybe we can tell someone we forgive them. Maybe we can act like we forgive them. But so often it can be hard to remove the pain and resentment from our hearts. We can find ourselves saying we forgive them, but still keeping a mental record of their wrongs. Really forgiving someone can be difficult. We regularly do it so imperfectly at best. And yet this is the pedagogical use of the law. We see how we fall short in this area of righteousness. And so we have to call upon Christ to be saved. We have to repent and believe in the gospel, just like in all the ways that we transgress God’s commands. I see no reason to treat this passage of Scripture any different that all the other laws we see in this Sermon on the Mount. It’s like that Matthew 5:48 call to be perfect as your Father in heaven is perfect. We are not. In faith and repentance we acknowledge that, confess it, mourn over it, and turn and flee in faith to Christ. We believe and trust that Jesus died for our transgressions. He died because for all the ways we aren’t perfect like our Father in heaven. And he died for all the ways we have not been merciful and forgiving as our Father in heaven is. Yet, Christ’s shed blood is sufficient to cover even that. Don’t miss that when you come to your passage. Start with these verses by realizing how you haven’t measured up to them, how you don’t deserve your Father’s forgiveness. How you need grace upon grace. But rejoice that as you come to Christ in faith, that you are indeed forgiven. This is the pedagogical use of this passage. Let’s turn then to the normative use of this passage. Hopefully it’s clear that the pedagogical use of this passage doesn’t mean that we have no other use for this passage. No, as a Christian it all the more drives home the normative use. The normative use says that we take this passage and see that this is how we are to live as Christians. We are to be striving to forgive others, because God has forgiven us in Christ. That’s the beauty of this passage. The very fact that we were driven to find forgiveness in Christ by all the ways we fall short of a passage like this, all the more drives us back to how important this passage is now for the Christian. Just like we read in the Bible that we love because God first loved us, so too we forgive because God first forgave us! We see this confirmed elsewhere in the New Testament. In Ephesians 4:32 we are told to be forgiving one another, as God in Christ forgave you. Or in Colossians 3:13, we are told basically the same thing, to be “forgiving each other; as the Lord has forgiven you, so you also must forgive.” The reality that we have been forgiven in Christ means that we should then be forgiving others in the same way. In other words, our passage for today which first drove us to find grace in Christ for how we don’t forgive as we ought, then becomes normative for us. We are then to seek to be forgiving like Christ has forgiven us. When we talked about the pedagogical approach it drove us to Christ and his grace. But don’t make the mistake that now when we talk about the normative approach that we don’t also need to be driven back to Christ and his grace. What I mean is this. The pedagogical use of this passage drives us to Christ for our justification by faith. But the normative use of this passage also drives us to Christ for our sanctification. It drives us to Christ to grow this righteousness in us, according to God’s normative laws for the believer. Again, how will a sinner saved by grace, really begin to forgive one another as God in Christ forgave you? Well, it’s through Christ and his forgiving heart to be at work inside you! It’s as Christ comes into our hearts and begins to live inside us, that we begin to look like Christ. Just think about how we see that with Christ. When Jesus hung there on the cross, dying for our sins, he showed forth this forgiving attitude. Where we struggle to forgive our enemies, he did it for us. He hung there on the cross and in front of his enemies said, “Father forgive them, for they know not what they do.” And so if Christ is within you, he’s developing his righteousness within you. We see an example of this with the martyr Stephen in the book of Acts. As he’s been falsely put to death for his faith, he said with his dying words about his enemies, “Lord, do not hold this sin against them.” By what power could Stephen say this? Surely by the transforming power of Christ within him. He who forgives as we should forgive — that is the one inside us now as a Christian. This is part of how God is saving us. He’s saving us from those hard hearts that want to withhold forgiveness. He’s teaching and training us to take today’s passage and live out it’s normative use. This too is a function of his grace and a benefit of being in Christ. So then, brothers and sisters in Christ, may you value forgiveness. This passage tells us how God has a forgiving and merciful heart and that he wants us to reflect such. May we be quick to extend forgiveness to others. May we know the forgiveness of God personally in Christ. And as we know how God forgives us in Christ, may we grow in how we show it to others. In fact, may we know divine forgiveness better, even as we learn about it when we show it to others. Think about that. When we are injured by someone, and forgive them, we get a small sense of some of the “cost” involved to forgive them. That will teach us more about what it meant for God in Christ to forgive us. In a similar way, when we find the joy that comes from letting go of the hurt and the injury in our human relationships, and having a restored relationship with that other person, we are reminded of the joy that has come in that reconciled relationship with God that we now have with him — again, because he has forgiven us. How important forgiveness is. How wonderful it is. And what a blessed passage that helps us to think about the connections of how we forgive others with how God has forgiven us. There is much more to meditate on this passage and these connections, and I encourage you to keep that up this week. To the praise and glory of our gracious heavenly Father and the Lord Jesus Christ. Amen.